Many of us have periods throughout our life when we have trouble sleeping, either due to an inadequate supply of the hormone Melatonin, needing to sleep at unnatural times of the day, long-distance travel, or problems with insomnia. For any of these reasons, you might consider using a Melatonin supplement. The supplement is a synthetic version of the hormone our brain naturally produces to maintain our circadian rhythms and sleep cycles. For many people, it works very well as a sleep aid. Others claim it gives them undesirable side effects, like a foggy, heavy-headed feeling in the morning or headache. Other side effects include vivid dreams or nightmares. 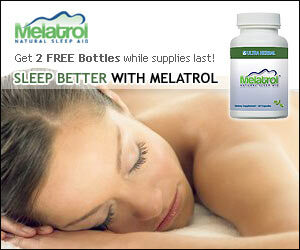 I have been using Melatonin off and on for fourteen years, and have personally never had any negative side effects. I have encouraged others to try it if they complain of sleep related problems. Over the years, a few of the people I advised experienced unpleasant side effects. When they complained to me about the results, my answer was always “take less.” Only one person refused to try it again. After that, if I recommended Melatonin, my first piece of advice was to take the smallest possible dose to start with. Recommended dosage varies by brand and by form. As a pill or tablet, the most common potency is 3-5 mg per pill, although it is available in a lower potency. It is also available in a sublingual form, with 1mg being a common potency. Melatonin is also available in the form of drops. I have used all of these, but my personal preference is the sublingual variety. Most brands and forms advise taking Melatonin 30-60 minutes before bed. Some sublingual brands recommend taking it at bedtime, so the dosage amount and times vary by brand and form. The maximum dosage also varies by brand. I have seen warnings not to exceed 3 mg in a twenty-four hour period, and I have also seen 9 mg as a maximum dosage. This is one of the reasons I recommend starting with the smallest possible dose. You might even consider cutting pills in half to lower the dose. As you determine how much you should take, keep in mind that our brain normally produces about .03 mg per day. One thing I would caution potential users about is developing a reliance on Melatonin. It can be habit forming. The official reports on dependency vary, but my own experience tells me that you can become reliant on it. If I use Melatonin for a longer period and then stop, I will notice that I crave the feeling and taste of the little pill under my tongue. I notice that it is not there and wish that it were. This generally passes after a couple of weeks, but it is certainly worth noting. When recommending it to friends, I tell them to take it as long as necessary to get their body rhythm back in sync, or to get them adjusted to a shift, but to stop taking it after a few weeks if not sooner.